The RAF Heraldry Trust aims to catalogue the heraldic badges for every RAF unit (squadrons, stations, regiments, etc.) both past and present. The initial aim is to complete as much of the collection as possible in time for the RAF’s 100th birthday in April 2018. The first part of the collection will be published to coincide with the Anniversary. The definitive hand painted pages will be housed as a permanent record in the RAF Cranwell Library, where it may be consulted by interested individuals and organisations, for educational and research purposes. The RAFHT’s aim is to preserve the heritage of the RAF which is otherwise in danger of being lost as the members of older squadrons pass away and the risk that their badges are forgotten or lost. The badges are repainted by heraldic artist, Mary Denton BA (Hons), on to goatskin parchment paper using 23.75 carat gold leaf and gouache paints which have an excellent resistance to fading. 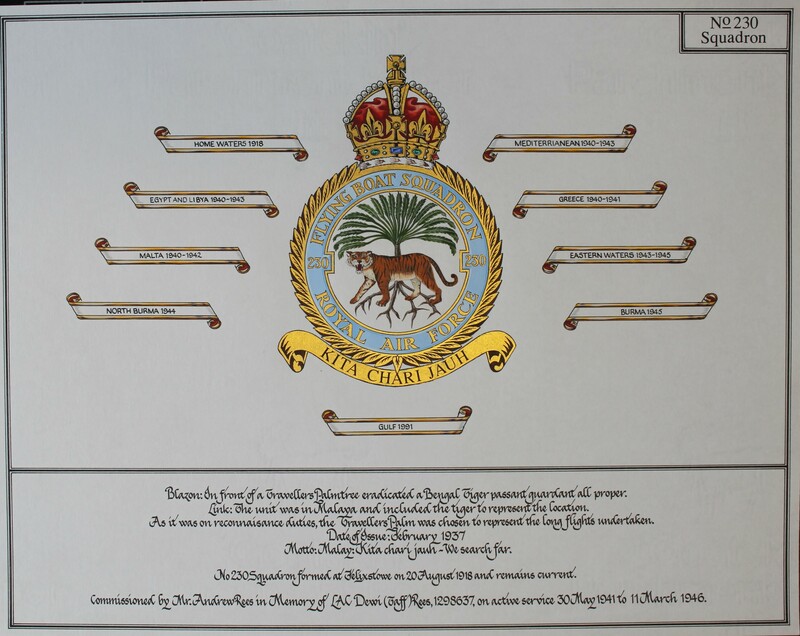 The image below shows an example of full artwork, the centre element is the badge; for those squadrons with Battle Honours, these are presented in scrolls around the badge (note that not all squadrons had Battle Honours, and with some squadrons the artwork was completed prior to the award of some Battle Honours). No units other than operational squadrons were granted Battle Honours. The box below the badge contains the history of the unit and badge, along with sponsor or dedication. Gold leaf is used rather than gold paint both for its visual impact and its preservation qualities. The paint used for the badges is also designed for long-term quality. The current Trustees are Charles Ross, Geoff Beck, Mike Cherry and Ken Delve. We would also like to recognize the contribution of previous Trustees, including Peter Latham and David Lee. Charles has been involved with the Trust since its inception, although he has a successful career as a veterinary surgeon and has served as an elected member of Council of the Royal College of Veterinary Surgeons. As Chairman of the Lightning Association and the owner of several English Electric Lightning airframes and cockpit sections, he originally became involved with the heraldry of the RAF when he commissioned Mrs Mary Denton to paint a service history of the Lightning, including the badges of the nine front-line squadrons which flew the Lightning and the badges of the RAF, Fighter Command and Strike Command. In conversations with Mary Denton about the heraldry of the RAF, Charles was surprised to learn that many of the official descriptions of RAF badge designs, the individual blazons, were incomplete, and this was the trigger for the formation of the Royal Air Force Heraldry Trust, of which Charles was the founder and so far only chairman. Away from the Trust, Charles arranged for the Lightning Association to purchase a potentially operational Lightning from MoD and then, as overall Project Manager, supervised its recovery for flight, followed by collaboration with British Aerospace to operate the then unique civilian-owned and operated flight of a Lightning. In the hands of a BAe test pilot, the fighter flew from RAF Shawbury to RAF Binbrook where it is maintained today in operational condition. Having served in the RAF as a Navigator for 20 years (Canberra and Tornado), during which time he also developed his passion for aviation history, publishing his first book in 1985 – a history of 39 Squadron. Meeting many veterans from the Squadron’s past created an interest in adding the personal stories and anecdotes to the often turgid official records, a theme that Ken has tried to follow in all his published works. Having left the RAF in 1994, he became Editor of FlyPast magazine, during which time he worked with Charles and Mary on promoting the work of the Trust. He is now an established aviation author, with over 40 books, and lecturer on a variety of topics. He is the founder of the Aviation History Research Centre (AHRC), an organization whose aim is to provide an on-line research facility for individuals and organizations. The major current project for the AHRC is an on-line database of all gallantry awards to RAF personnel. Not a Trustee as such, Mary is the Trust Artist and a driving force behind the formation of the RAF Heraldry Trust.